annie is one. 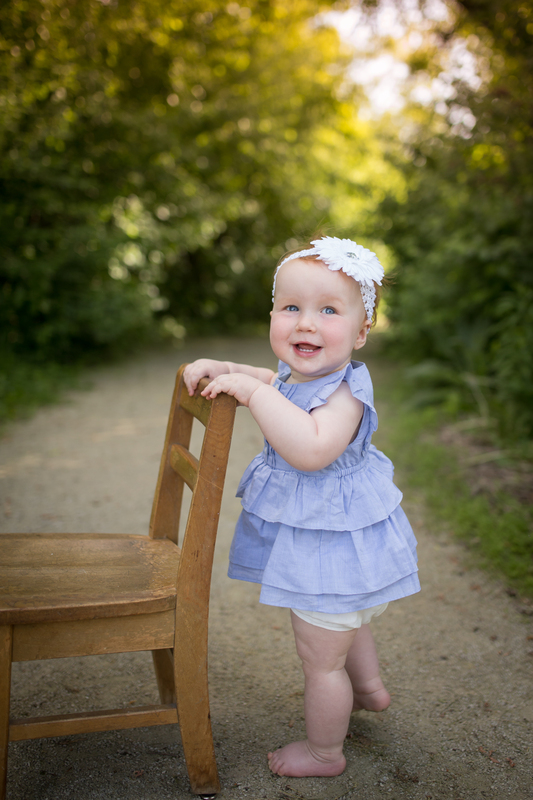 | emmy kay and co.
Annie, my sweet baby, is one and on the verge of walking and talking and expressing herself. It turns out, her past year of docile compliance was just a cover: she has been taking notes, identifying weaknesses and formulating a strategy. As of this week, she has decided she will NOT stand for being locked up in a baby-safe containment area (or, crate, as I call it) while I work out and shower. Once she is free of the bonds of the minimum security baby containment facility, she immediately bolts for any doors she can find. Cabinet doors and drawers that are unlocked are unceremoniously opened and slammed shut with deep, unmitigated baby satisfaction. Annie did run into a minor hiccup with opening standard doors: once the door swings open away from her, she found herself standing unassisted. The first few times, she plunged forward after the swinging door in sheer terror. Now that she figured the tricky doors out, she smirks as she maintains her footing and the door crashes open. A fan of her sisters, Annie is completely delighted by any attention they pay to her. Ellie is much more amenable to Annie’s hair pulling and grabbing, while Carrie gets annoyed by these shenanigans rather quickly. Despite Annie’s interest in slapping her sisters silly, the twins adore making Annie laugh and giggle. Annie says a few words that sound like “Hi!” and “Daddy!” and “MAMAMAMAMA” and so on. I’m terrible at understanding baby talk. I’m lucky if I understand half of what the twins are hollering at me from the third row of the minivan. All that to say: Annie may be reciting soliloquies from Shakespeare and I have absolutely no idea. Annie is walking! It is unsteady, precarious walking, but it is walking! I am both relieved (my child can walk!) and terrified (my child can walk!). I recall, all too clearly, the poop-storm that ensued with twin toddlers and while Annie is only one child, she is one of three very active girls. No matter. We survived the twinpocalypse, I am sure we can make it through one more unstable toddling little one. In short, Annie is one and is walking without fear, speaking without annunciation and drinking without a bottle. And so… I think I better hit publish on this post before it’s 2027 and Annie has discovered the Internet (or whatever it will be called then) and realizes that I still haven’t published her first birthday summary!